Allô, Bijou is the story of a happy little dog who finds herself friendless in France and is very sad. But the local canines come to know of her plight and work together to make sure she joins their group of happy dogs, playing in beautiful French gardens. 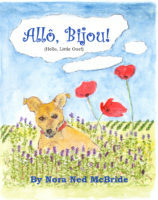 Bijou means small precious thing in French, and that is precisely what the main character, Heidi–a British terrier mix–becomes in her welcoming neighbourhood in southern France. A spritely book that will help younger children overcome the trauma of relocation, but will appeal to children from six to 10 years of age who like pets, as well as to adventurous children who want to find out about life in foreign countries. The book contains around 16 illustrations by the author. The second book in the series, Bijou to the Rescue is out now! Click here for information.